What makes a photograph more than just a snapshot is the way textures and tones, the blending of light and color, and composition tell the story of the moment. The more you look at a piece of photographic art, the more you see and are moved. As a Social Landscape Photographer, I look to capture personal and unusual moments during apparently ordinary events in the lives of individuals; the way they act and react in and to their environment. 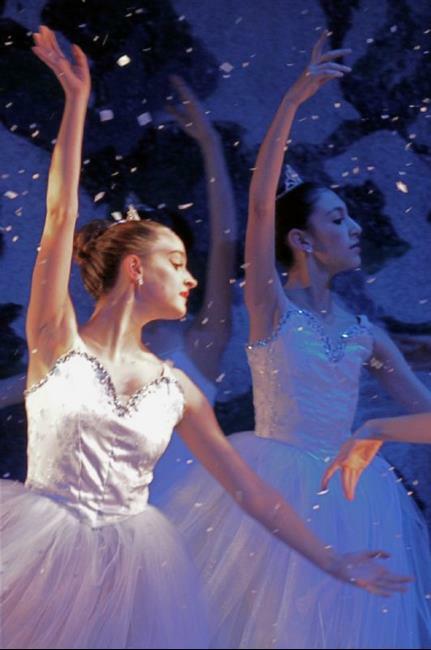 This past fall I recorded a local dance company's 10th Anniversary production the Nutcracker, from auditions through final performance. In this piece, we are in the Land of Snow at the end of the first act in one of the performances. The two performers visible are 14 and 12 years old respectively and exhibit their joy, poise and sheer professionalism through their art. The grace of the hands tell the whole story.